This week’s Journal52 prompt just seemed to create itself. I had barely read the prompt–Nature Inspired–when the mail arrived and I saw the gift that a friend had sent…it all fell into place from there. 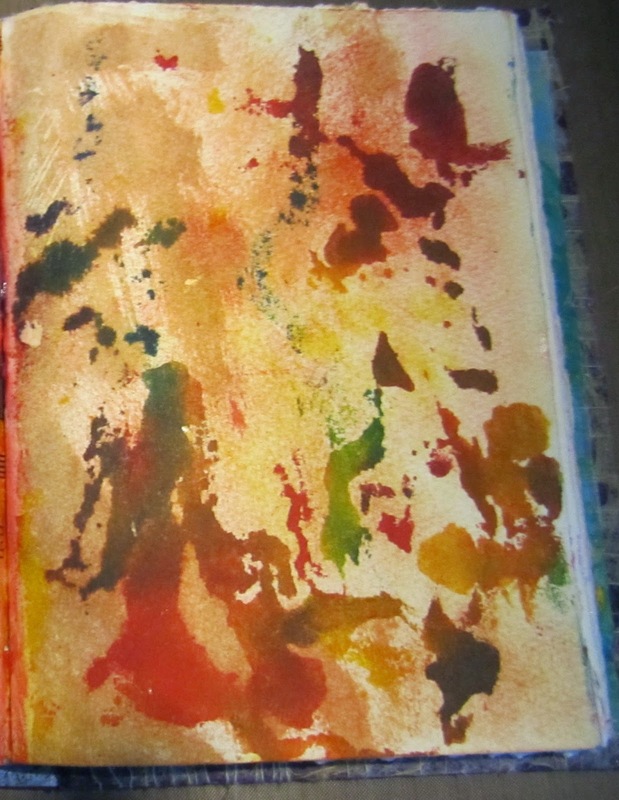 Step 1: I already had a lot of color on the page from last week’s prompt, where I had closed the book and transferred excess paint to this week’s page. I wasn’t sure how the color would tie in. As it turned out, I covered most of it, but it supplied some interesting background shapes and made for a richer color overall. And my friend Robyn sent me this cool soda can cut-out (along with several soda can hearts). The moment I saw this, I knew what I wanted to do. Step 2: I started by blocking out the shape of the moon. To start with, I wanted some transparency, so I could decide how much of the background color to keep as I went along. I squeezed out a little Metallic Yellow and spread it with a baby wipe. Then I squeezed some Antique White (which is not transparent) and spread it out, letting the two colors mix until I had the tint and level of transparency I wanted. Step 3: I used Metallic Blue to color in the sky. Again, there is transparency with this color. I knew I’d probably cover up most of that background, but I wanted to keep my options open, and save those shapes, for as long as possible. Step 4: Once I had my major shapes colored in, I wanted to start modeling. You are probably aware that when you talk about shadows and shading, you have shadows that are cast–for example, a tree that blocks the light of the moon casts a shadow where the light is blocked. But you also have shadows within an object that are caused by the shape of the object. The moon is round, therefore it has shading that occurs because parts of the moon are closer to the light source than others. (and while the the moon is the light source for forest, the light source for the moon is the light from the sun). When you add this kind of shading, you are modeling the shape. Many factors affect modeling. It can be dramatic, but is usually more subtle. 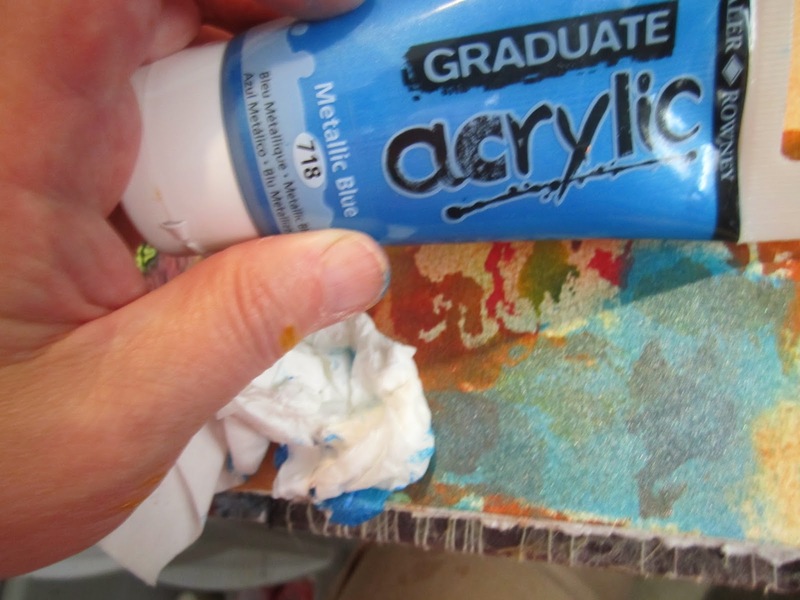 Often you shade with color that is only slightly more intense or darker than the main color. I chose to shade with metallic pink, and then add highlights with a very pale pink–it’s almost white. 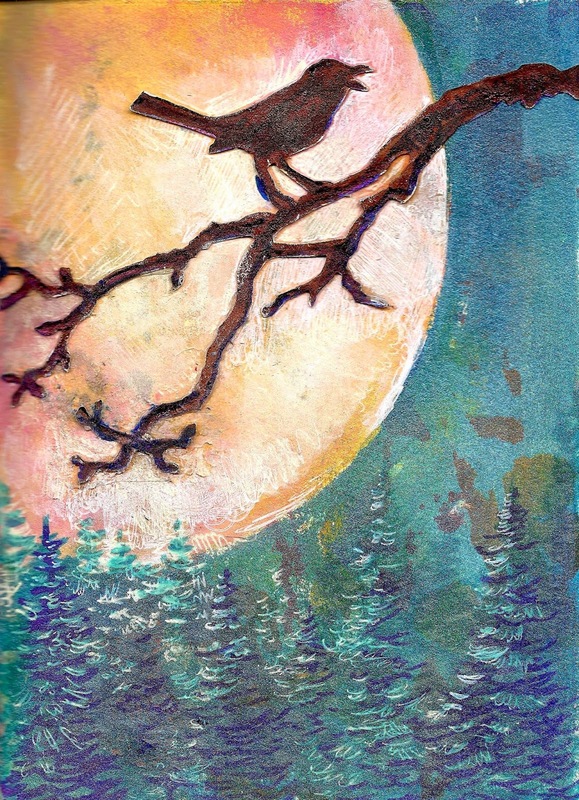 I wanted my highlights to be around the bird and branch shape so that the highest contrast of color would be there. So I placed the cut-out on the page and dabbed the pale pink around it. Then I used the baby wipe to add the Metallic pink in sort of a semi-halo shape around the inside edge of the moon. I blended it with the pale white. While I wanted to imply roundness, I didn’t want it so noticeable that the moon became the main focus. The other thing about my color choices was, again, a matter of transparency and opacity. The pale pink, being almost white, was very opaque, allowing very little yellow to show through. The pink was very transparent, and added a blush, but let much of the yellow show through. This is a more subtle form of contrast, that will add to depth. Step 5: Once the paint had dried completely (5-10 minutes), I spread Polymer Medium on the back of the bird branch shape and glued it down to the page. Golden’s Polymer Medium comes in a jar, but I pour small amounts of mine into a plastic container with a tip that makes it easier to use. Step 6: I let the Polymer Medium dry, holding down the tips of the bird branch so they’d stick properly. Then I add the trees, using Sharpie markers. I wanted the trees to be mostly shadows with a few highlights catching on the branches. I decided to draw evergreen trees rather than deciduous, partly for simplicity. Firs are easier to draw, and partly for contrast, making the deciduous branch a stronger focus. I kept the colors somber and closesly related to the sky color. The closer to the sky color the farther away they seem. The darker blue trees seem closer, adding to the sense of depth. Gellyroll gel pens were used to add white and yellow highlights, and I added more yellow highlights to the moon. (My scanner picks up all the gel ink as white and makes it stand out more. It’s all more blended on the actual page). Step 7: To finish off, I modeled the bird and branch, using the blue Sharpie to add a shadow along the middle for a sense of depth to the shapes. The whole thing took about 1/2 an hour, including drying times. The process was much faster to do, than it was to write up, lol. I looked at your 2nd picture and saw a tall woman walking a poodle. All in the eye of the beholder. Great write up and a fabulous piece of artwork too. Thank you! I saw the tall woman and a boy waving a flag and a dinosaur and some birds flying. If I hadn't had the cut-out I probably would have done something with the splatter figures. That was what I originally thought I would do. But then, more often than not, I take a right instead of the left I had planned on–I'm just ornery that way, lol!